Air conditioners may look similar, but their Seasonal Energy Efficiency Rating (SEER) can vary widely. Higher SEER numbers save more money spent on electricity. A 13 SEER air conditioner, the EPA "current minimum standard", uses 23% less energy then a 10 SEER unit (EPA standard up until Jan. 2006). 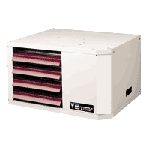 Even though 13 SEER is the minimum efficiency available, we currently offer a line of air conditioners that start at 13 SEER and go all the way up to a 20 SEER. Depending on your average usage, higher SEER air conditioners can significantly reduce your electric bill. 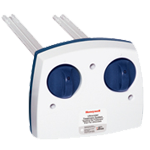 We offer many fan coils with variable and multi-speed features that can provide enhanced indoor comfort by slowly ramping up to your thermostat setting rather than simply turning on at full speed. This alleviates the "cold air blow" often associated with single speed fan coils, and dramatically reduces system noise. If your home has hot water radiators in each room for heat, you have a boiler to heat the water. Like a furnace, the energy efficiency of a boiler is given as the Annual Fuel Utilization Efficiency (AFUE). 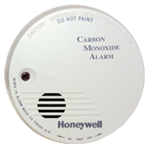 Boilers manufactured since 1992 must have an AFUE of at least 80%. We offer a complete line of gas and oil boilers starting at 80% AFUE and up. With a traditional heating and cooling system, if you wanted to save more, you had to use less. But a Hybrid Heat system combines the benefits of intelligent control for both gas and electric heating to create an intuitive system that can actually react to changing conditions. No matter what the temperature is outside, a Hybrid Heat system will automatically select the fuel source most efficient for your home, which means you'll stay warm in the winter, cool in the summer and save money all year long. 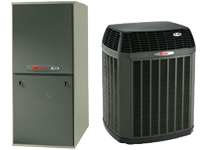 To design a Hybrid Heat system for your home, we professionally match one of our heat pump units with a natural gas furnace. Contact us to see how much energy you can save over your existing system. 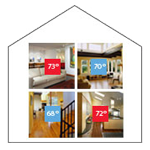 Room air conditioners make your home's individual rooms or other small spaces more comfortable. Remember, just like whole-home systems, the higher the SEER and HSPF ratings, the more efficient they will be. 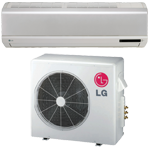 We offer a variety of window room air conditioners, through-the-wall packaged terminal air conditioners (PTAC) and ductless heating and cooling systems to meet any individual room's needs.